16 Nicholson Street, Glasgow. G5 9ER. Tel: 0141 429 6279. Now called The Devils Advocate. Tel: as above. 2006. New rendezvous opened by the riverside. Hanrahans is the new tavern in the town so if you fancy a drink down by the riverside, at the Sheriff Court end of Carlton Place at the corner of Nicholson Street to be precise, then this upmarket, riparian rendezvous is the place for you. With its hanging sign of kilted mermaids holding a St Andrews shield above a Latin motto and its discrete, stone-cleaned exterior, this exemplary inn, whose upper floors are devoted to dining in style, makes a perfect Clydeside recreation spot a stone's throw from the suspension bridge and the good ship Carrick. Open Monday-Saturday from 11 am to 11 pm and on Sunday from 7 pm to 11 pm, Hanrahams embodies the spirit of traditional inn keeping which throve in the heyday of the tobacco lords of Glasgow and the great shipbuilders of the Clyde. It is the latest venture of the McFarlane Group which was founded 14 years ago when chairman and managing director Robert McFarlane had a vision to see the potential of the newly completed Clyde walkway. 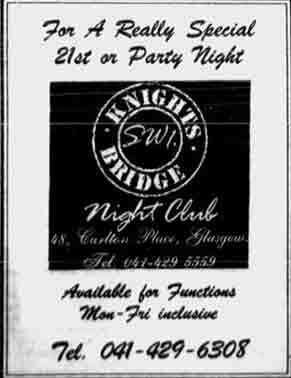 He opened Glasgow's first purpose built disco Spankies in 1974 at Custom House Quay, then a year later the city's first walkway pub Waves next door, which was granted an outdoor drinks licence, another city first. With the opening of Hanrahans on the south bank not far from the company's Knightsbridge SW1, a pioneering Western eating house, it can be said with some justification that, in conjunction with The Advocate and Panama Jax on the northern shore, this enterprising entertainment concern really does cover the waterfront. From the outside Hanrahans has the air of a genteel English inn dating back to Georgian times. The swinging painted sign board with its nautical but nice theme is redolent of historic ports and quayside taverns full of eager seafarers waiting to sail on voyages of discovery. Once over the terrazzo threshold that voyage of discovery begins. 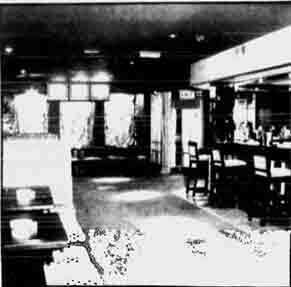 The Club Room on the ground floor is a de luxe lounge bar with practical tall bar stools and comfortable banquette seating round the walls. The solid oak bar sports a magnificent Edwardian gantry inlaid with gold, and houses etched glass mirrors in the art nouveau style and art glass panels at the top. A gleaming ship's clock is a central feature and a ship's bell is tolled to herald the end of the day's proceedings. In-house design consultant and Bud Neil biographer Ranald McColl has captured all the ingredients of prosperity from the great days of empire. There is a wall display of clay pipe-making equipment, cigar rolling techniques, and sepia photographs of the bustling Broomielaw. Oak panelling complements a richly patterned, terracotta wallpaper straight out of the pages of The Grammart of Ornament. 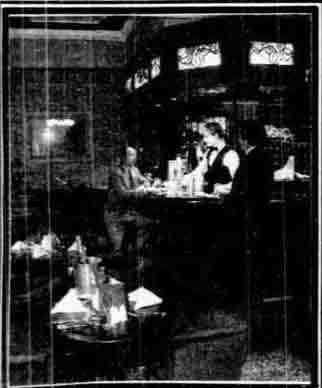 Parquet flooring, a central chandelier and substantial brass bar rails imparty a sense of pre-first World War security making Hanrahams seem a safe haven far from the glamour of inner-city life close by. There are at present three beers available on draught and an above average selection of bottled imports. Real ale is planned for the future, spirits are served in quarter gill measures and there is a growing array of malt whiskies from all over Scotland. Three different grandes marques champagnes lie chilling behind the bar and the first patron well versed in the classics who furnishes an apt translation of Hanrahans Latin legend Quinque Lonicra Periclymenium et Piscis Prandium will win a sparkling prize. Resident Professor Roger Ferdinand will adjudicate and his decision is final. Although freshly prepared sandwiches and home made soup are available at all times downstairs, it is the first-floor Green Room which should attract the legal fraternity and anyone else who can do justice to good food and specially selected wines. Chef Eric Kennedy is in charge of the kitchen, country house hotel-trained Simon Sutherland is in the manager's chair, and company stalwart Bernadette Doyle will render services with a smile. Lunch and evening meals are served from midday with last orders at 2 pm and from 6 pm until last orders at 9.30 pm. Seafood starters include fresh mussels vinaigrette and half dozen oysters when available. There is always a home made soup at £1.10 and a hot dish-of-the-day at £2.25 but other menu delights are smoked Scotch salmon with lemon and brown bread at £3.25, roast rib of Angus beef at £2.95, honey roast ham with spiced peaches at £2.50, and smoked turkey breast with fresh orange salad at £2.50, inclusive of trimmings. Filled baked potatoes can also be ordered and the carte is expanding weekly to meet customers' demands. The wine list is comprehensive with an extremely potable 1986 Sauvignon de St Bris at £8.50 but bin end bargains are promised as well as regular tastings to determine its eventual form. The decor in the dining room with seating for 18 has been tastefully chosen. The walls are Sicilian green, the carpet is Persian, and Hanrahans map of the world looks splendid in its gilt frame. A marble Venus rises in an alcove and fresh flowers in white Austrian porcelain pots grace every table. To cater for small meetings and private dinner parties there is a second-storey dining room which can be reserved for up to 20 people board room fashion or up to 16 people eating. For that special night out parties can draw up their own menus to be cooked to order and have the wines of the world at table if required. 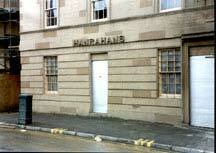 Hanrahans is convenient for the Citizens' and pre-theatre suppers can be ordered by telephone. No matter what your trans pontine excursion, however, Hanrahans is at your service but a mystery still remains. 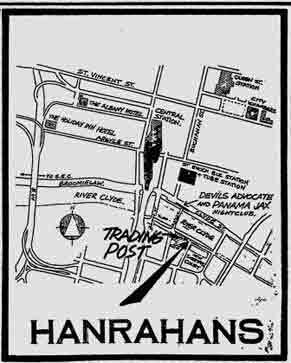 Who was Hanrahan? A visit to this Clydeside watering hole will reveal all. Interior view of the Knightsbridge SW1. 1988. The nightclub scene has a sophisticated newcomer with the opening of Knightsbridge SW1. It's situated on the waterfront, on the south side of the river at 48 Carlton Place. Designed to appeal to those who like to let their hair down in upmarket surroundings, Knightsbridge SW1 is in the vanguard of development in a part of the city which is being transformed. It is the latest spot from a company which has am impressive track record in establishing successful and stylish restaurants and clubs. 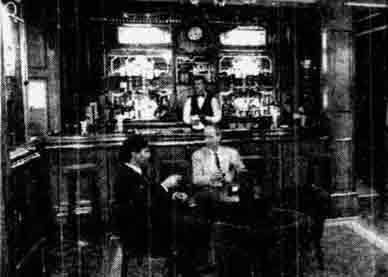 The McFarlane Leisure Group, owners of fine stable of racy diners and discos including Panama Jax. The Advocate, The Trading Post and Hanrahans, have chosen Carlton Place for their stylish disco and reckon that city sophisticates will agree that it's a winner. "Carlton Place is very elegant and beautifully situated beside the river, just across the suspension bridge from Panama Jax," Roger Ferdinand, marketing manager with the McFarlane Group told me. "There's £6.5 million being invested in the area by Glasgow District Council and private developers, and it's the idea site for a sophisticated nite spot. Knightsbridge SW1 is situated within one of the elegant terraced buildings, and is entered via the basement. Inside, the night spot is on three levels, Luxuriously furnished and decorated and equipped with the latest high tech sound to light systems. Just inside the entrance is an elegant bar area, and on the next level, there's a dance floor. "We've really gone to a great deal of trouble to provide the kind of setting which will appeal to a discerning clientele," said Roger, adding that the club is strictly for the over 21 age group. Overlooking the dance floor is a terrace lounge and a small restaurant. Also see Panama Jax and the Devil's Advocate.